-Are you sick and tired of uneven rolling of your dough resulting in uneven baking and cooking? -If you love making and serving delicious foods and are looking for perfect gadget to make your life easy, then search no further! What you need is a rolling pin! 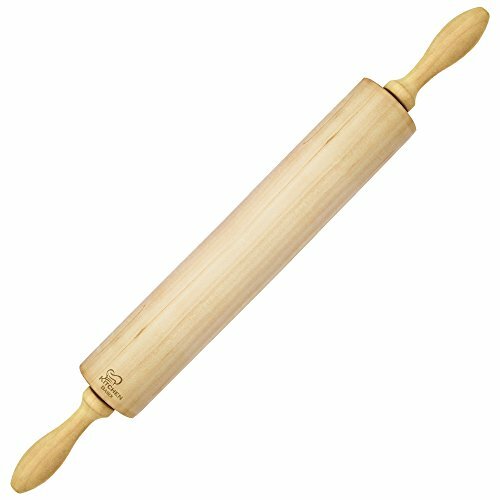 -KitchenBasix Rolling Pin is the finest solution for quick and easy rolling of Pasta, Cookie Dough, Pastry, Bakery, Pizza, Fondant, Chapati & Much More! It's absolutely multipurpose! -The stylish looking, thick, handle fits perfectly in your hand giving you excellent grip. This premier quality tool has been ergonomically designed for ease of hold and use. The built-in bearings make the rolling action a breeze! -KitchenBasix Rolling Pin, the best of its kind, is developed after extensive research and development by a team of experts, and tested by professionals. -Cleaning and maintaining KitchenBasix Rolling Pin is simple. Just wash it with soapy water and dry. -Lifetime, money-back guarantee! If you are not satisfied with the product, get your money back! -Since there is zero risk, click on Add to Cart Now to bring this essential tool to your kitchen and also enjoy the amazing discounted price while stocks last! PREMIUM QUALITY SOLID WOOD - Made from durable, moisture-resistant hardwood. Will last you a lifetime! ERGONOMIC DESIGN & GRIP - Premier quality tool designed for ease of use and hold. Equipped with bearings to ensure smooth movement. PERFECT SIZE - 16.5 inches by 2.2 inches - Ideal for all your rolling needs. MULTI-PURPOSE - Can Be Used for Pasta, Cookie Dough, Pastry, Bakery, Pizza, Fondant, Chapati & Much More! LIFETIME WARRANTY! If you are unsatisfied with the product, get your money back! Since this is a risk-free purchase, go ahead and CLICK ON ADD TO CART NOW to bring this essential gadget to your home and enjoy cooking food! If you have any questions about this product by K BASIX, contact us by completing and submitting the form below. If you are looking for a specif part number, please include it with your message.